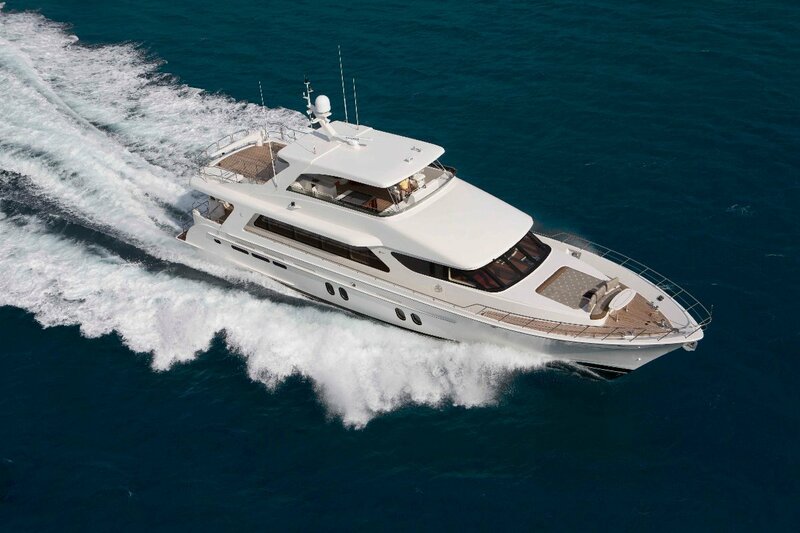 The all new Bravo 88' offers sea-keeping unmatched by other motoryachts in this sector. A fine entry and deep forefoot combine with beautiful yet functional bow flare to maintain a soft, dry ride. A centerline keel ensures precise tracking even in testing sea conditions, while high lift sections aft prevent squat at transitional speeds. Combined with a light but incredibly strong resin infused composite structure, the Bravo 88 runs highly efficiently right through the speed range. 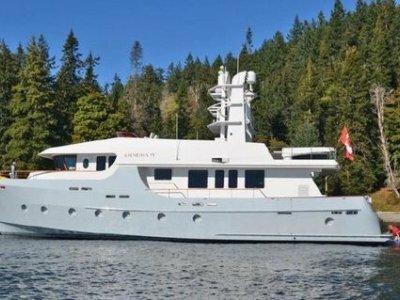 Working closely with structural engineers High Modulus of New Zealand, and Seattle based interior designer Sylvia Bolton, the design team headed by naval architect Mike Burvenich have developed a truly exceptional yacht. 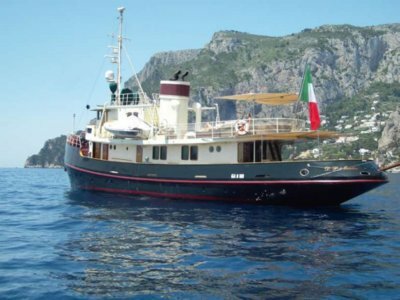 The layout accommodates eight guests in four ensuite staterooms, with two crew staterooms aft. Living areas on the main and flybridge decks entertain the guests in fine style. With timeless beauty in everything from the hull to the smartly appointed superstructure, the Bravo 88 will stand out in every port with style and grace. The Bravo 88 boasts a luxurious four stateroom layout. The design is elegant and contemporary, each cabin offering an unsuited head and shower, well it, open and airy with plenty of storage. The full beam master and VIP offer high levels of comfort and relaxing vistas through beautifully styled hull windows. Knowing how owners use their yachts is important. 140 years of understanding customer needs is one of Cheoy Lee's many assets. The deckhouse can be considered as two distinct living areas. The open comfortable country kitchen is a good gathering place for our family and friends. With a formal dining area and bar, the salon is perfect for elegant entertaining, and gently curved couches invite you in for conversation or movies. We know you like alfresco entertaining, too, so the spacious after deck has an open air dining table and wet bar. Twin stairs lead down to your private "beach" on the transom platform, making boarding from the dock or a tender safe and easy. Primary access to the well-appointed crew quarters, complete with lounge and galley is from the transom, with secondary access from the aft deck for safety while underway. A wide and gentle staircase leads from the aft deck to a spacious fly bridge protected from the elementary by a full hardtop. Underway or at anchor, you'll will appreciate the built-in dinette and curved settee, and the full bar is a god place to keep an eye on the chef, at the outdoor galley with barbecue. The Bravo 88 boat deck easily accommodates a 15' RIB of your choice... No more worries about an undersized tender! The foredeck is sculpted to receive large, comfortable sun pads or available table and seating, with safe access via wide side decks with high bulwarks. Now all you needs is a cold drink, and you are ready to watch the world go by! The Bravo 88 is built for the knowledgeable yachtsman who sees beyond the highly polished fixtures and exotic inlays. Knowing what's important, our construction and ship calibre engineering will give years of trouble free service and durability. You will immediately notice the differences, building widely diverse vessels, is a qualification that exceeds all others for the production of superior quality yachts. You're knowledgeable about yachts, so take your time looking around the engine room. Cheoy Lee has a shipbuilding division, building everything from ocean going ships to tugs for the Panama Panel Canal. The Bravo 88 benefits from professional mariners who won't tolerate anything less than the very best. They expect rugged construction, simple to maintain systems, and seaworthy installations, and that's what you will find on the Bravo 88. 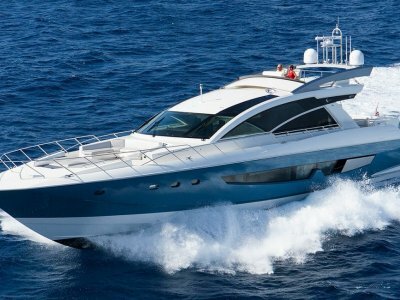 A truly great yacht like the Bravo 88 isn't just about superior finishing, inlaid woods, and stainless steel rails, fittings that are works of art, and sumptuous suede and marble work. It is about systems built to last, and function under harsh conditions. It's about the absence of any structural wood. It's about clearly labelled wiring and electrical panels with ship grade durability. It's about integral tanks that create a double bottomed hull for safety. It's about installing the finest equipment with the best warranties. Superior construction and unequalled engineering. A promise we've kept for 140 years. Sight down the hull; it's a perfect mirror finish with no bumps or hard spots. That's because we put in the extra hours making our fiberglass work absolutely perfect. And that's a sign of quality you can see. The fiberglass tanks- fuel, water, and holding - are moulded into the hull, creating a double- bottomed safety zone in case the outer hull is holed. This type of construction adds greatly to the strength of the hull while towering the center of gravity of the yacht. And, of course, you'll never worry about corrosion in the Bravo 88 tanks. With the carefully engineering structure, integrated vinylester laminates plus an epoxy barrier system on the hull bottom and no structural wood, the Bravo 88 is warranted for five years against any structural problems or osmosis. When it comes to good looks, Cheoy Lee won't settle for just a gel coat finish. Each Bravo 88 is impeccably finished mega yacht standards with Awl grip or Alexseal coatings designed for the marine environment. Not only does it have a brilliant gloss, but it will last years longer than gel coat. Take time to poke around the Bravo 88... And we mean open the hatches and peer into hidden corners. You'll begin to understand what Cheoy Lee means by "superior construction". The hull, deck and structures are resin-infused multi-axial E-glass laminates with foam coring and specialized carbon fiber reinforcements in critical areas. This methods is continued through the internal bulkheads and cabin soles creating a light but incredibly strong monocoque structure. Unlike other builders, we use no structural wood in the Bravo 88, so there is never any danger of rot weakening any structural component. 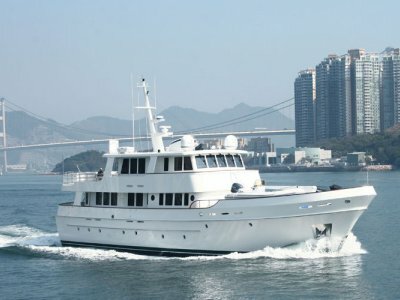 The Bravo 88 is the brainchild of a long standing partnership between Cheoy Lee and the naval architect Mike Burvenich. Given a tough challenge to create a yacht that was comfortable in a seaway, fast enough to outrun a squall or get to the best anchorage first and, even tougher, be highly fuel efficient, the team delivered. Once the lines were completed, Cheoy Lee brought in High Modulus, the renowned structural engineering company whose portfolio ranges from American's Cup yachts to military craft. As the world leader in composite engineering, High Modulus performed an intensive structural analysis, and then provided an optimized construction program based on RINA classification requirements for high speed craft. When it comes to equipping the Bravo 88, we know you won't accept "good enough". Neither will us. Every piece of equipment and every system on the Bravo 88 was carefully chosen not for price, but for reliability and suitability. When you need our support, Cheoy Lee's response is second to none. Our shipyards 140 year did not arrive overnight. It was earned, day after day... One owner at a time.